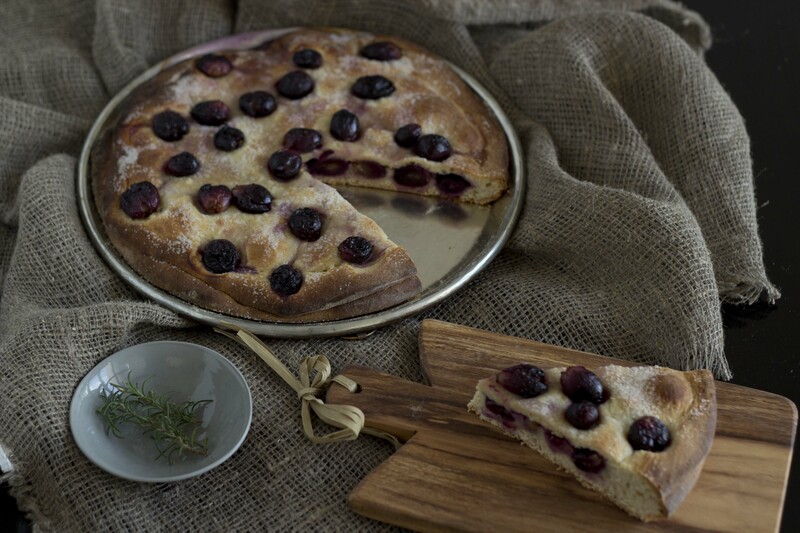 This sweet bread is traditionally made during the grape harvest season in Toscana. 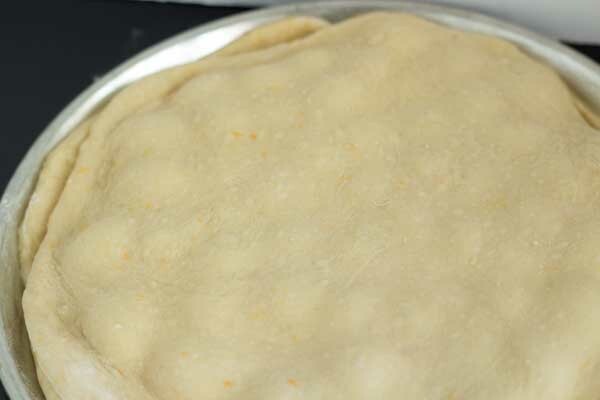 It is quick to make but requires some advance preparation to allow the dough to rise. If you are not using rosemary, skip this step. In a small frying pan add the olive oil and the rosemary. 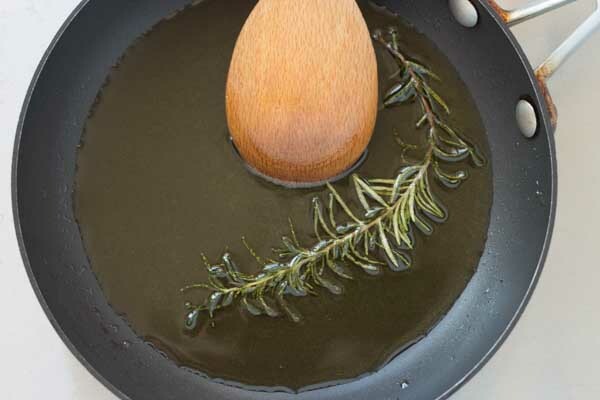 Heat the oil and the rosemary until the rosemary has turned colour but is not blackened. 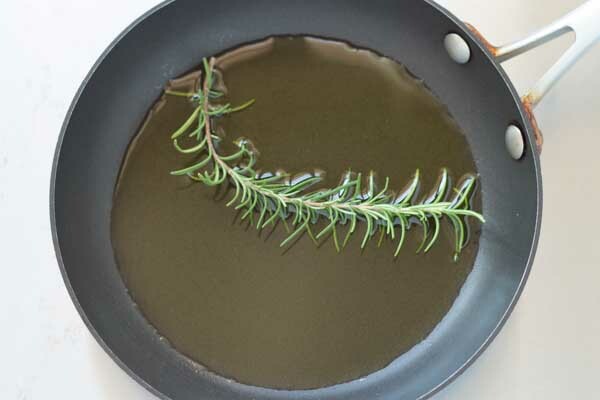 Discard the rosemary and allow the oil to cool. Set aside. 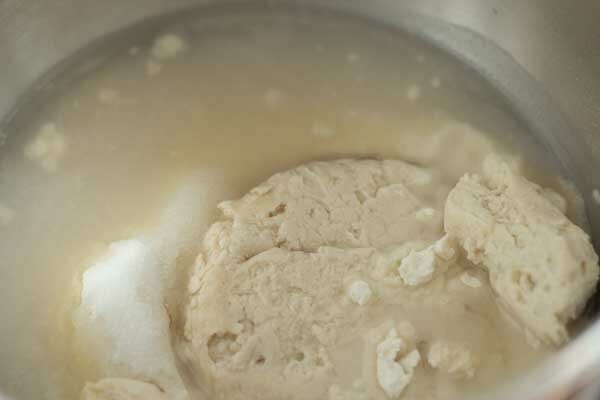 Put the biga with the flour, 150 mls of the sugar, salt, and water in a bowl in a standing mixer with the dough hook attachment and turn it onto low until well combined, about 4 minutes. 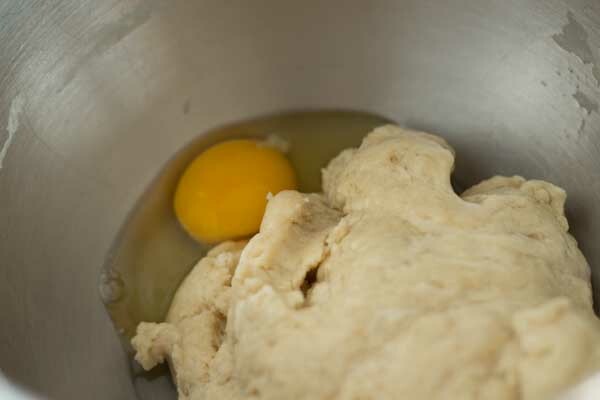 Add one egg and mix until well combined, about 3 minutes. 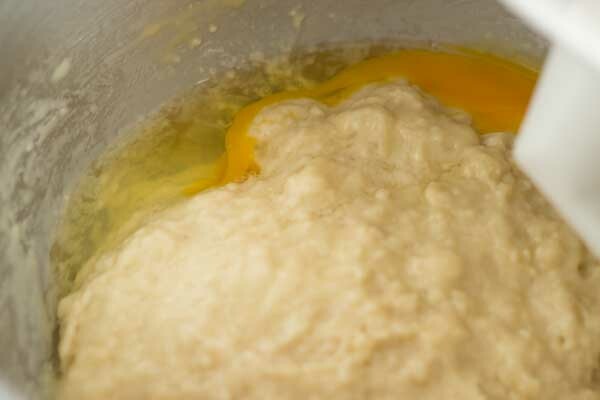 Repeat with the remaining egg, mixing until well combined, about 3 minutes. 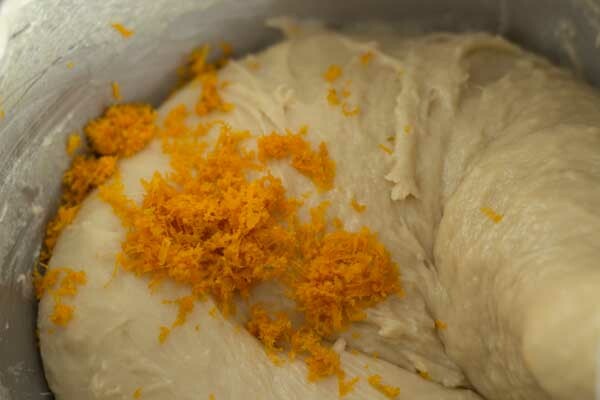 Add the orange zest and mix for 12 minutes on low. 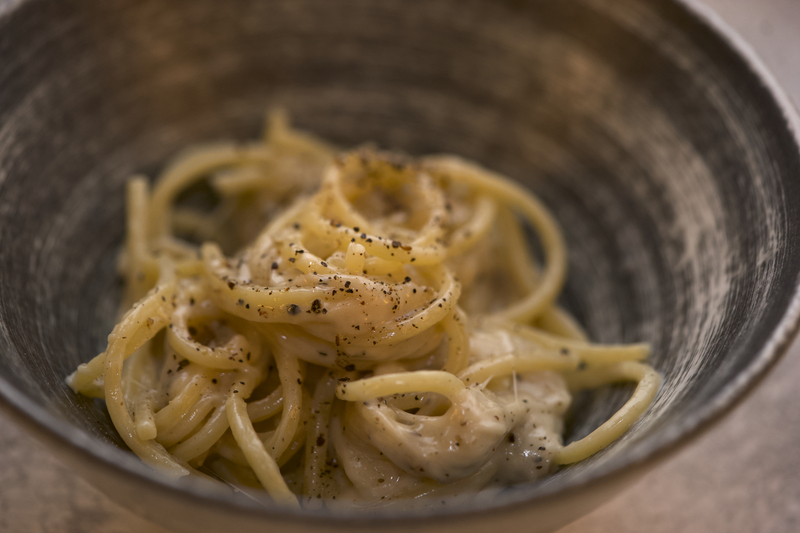 You should have a nice springy dough. When the dough is done, place in a bowl, wet a dish towel and wring out and cover the bowl with the towel or cling film (plastic wrap). Let rise for 2 hours or until doubled in size. Brush 10 mls of the olive oil on a metal tin. 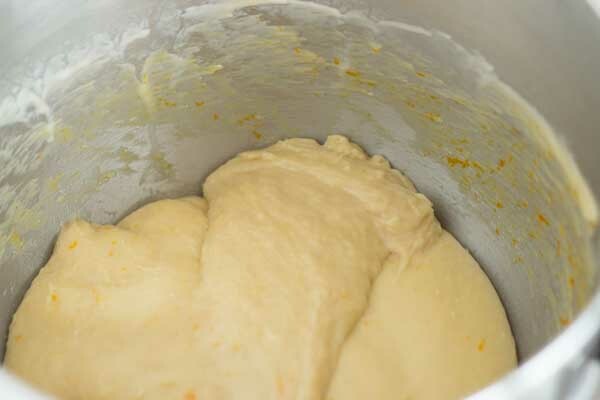 Split the dough into two pieces. 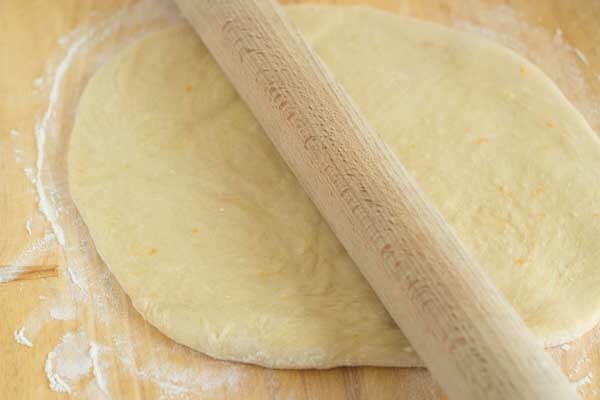 Sprinkle flour on a work surface where you can roll the dough and place one of the dough pieces on it. 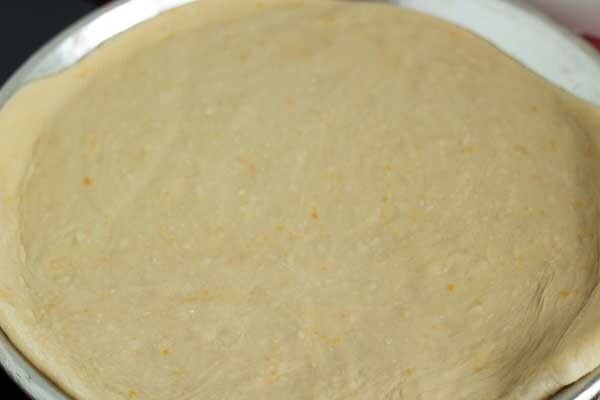 Sprinkle the dough with flour and roll out to 1 cm. Put the dough on the prepared tin. 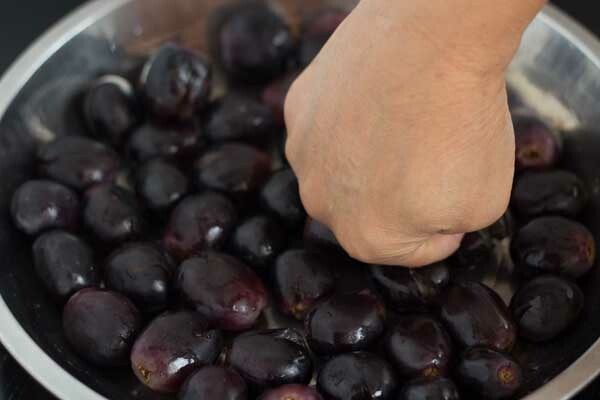 Place the grapes on a plate and with your fists, push down until the grapes split open a bit. 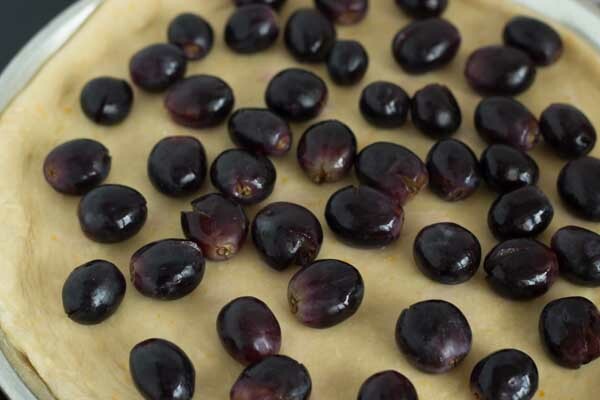 Place ⅔ of the grapes on top of the dough. 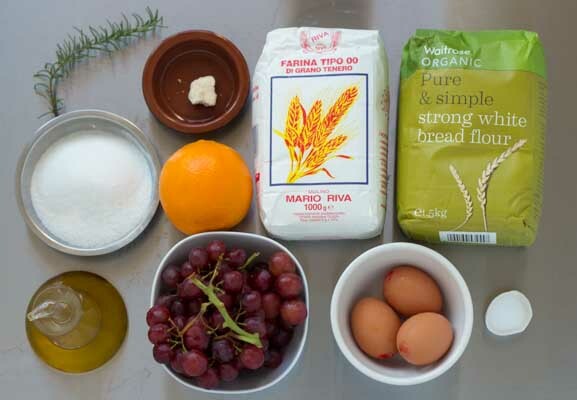 Roll out the second ball of dough to the same size as the first one and place on top of the grapes. 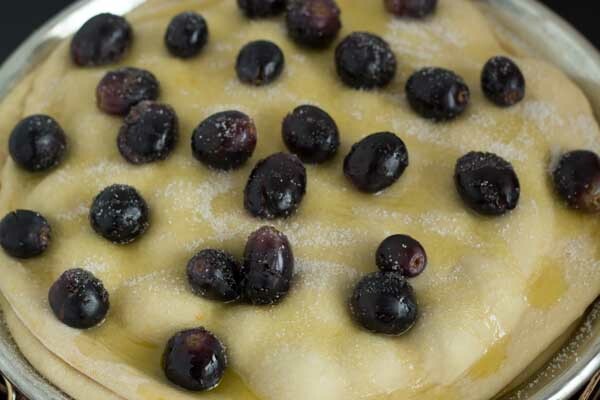 Place the remaining grapes on top of the dough, sprinkle with the remaining 20 grams of sugar and drizzle the remaining 30 mls of olive oil over the top. Spray the top with water and let rise for 1 hour. 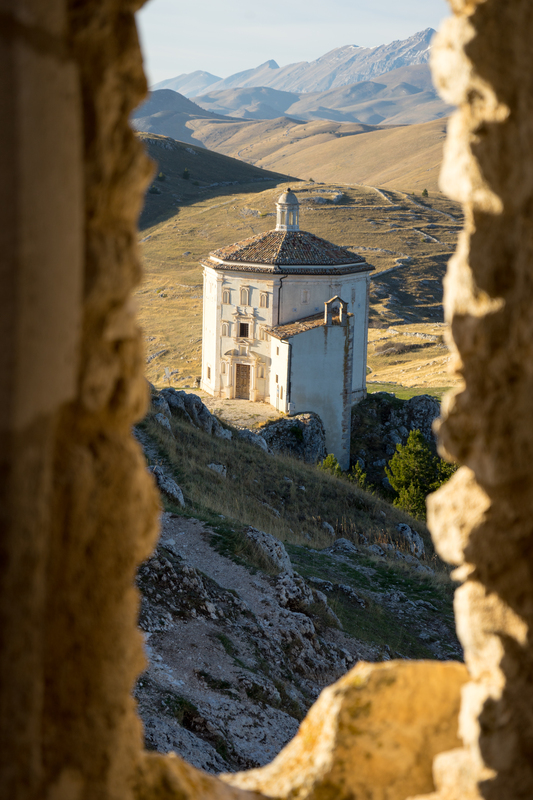 Place a baking stone or an upside down baking tray in the centre of the oven and heat the oven to 220˚C. Spray the top again with water and place in the oven. 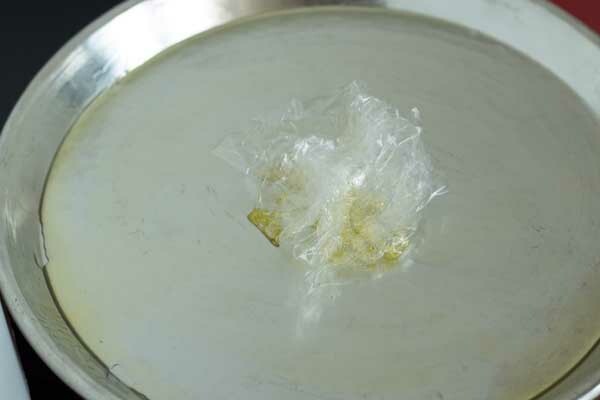 Check it after 15 to 20 minutes and if the top is browning too much you can loosely place a sheet of foil over the top to impede overbrowning. 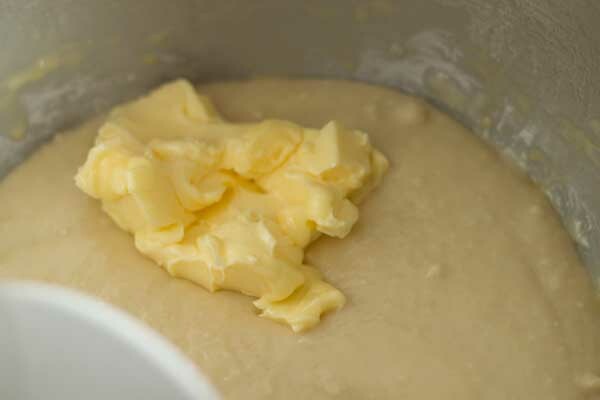 Check again after 25 minutes and if juice is accumulating in the pan, pour it off and reserve it. 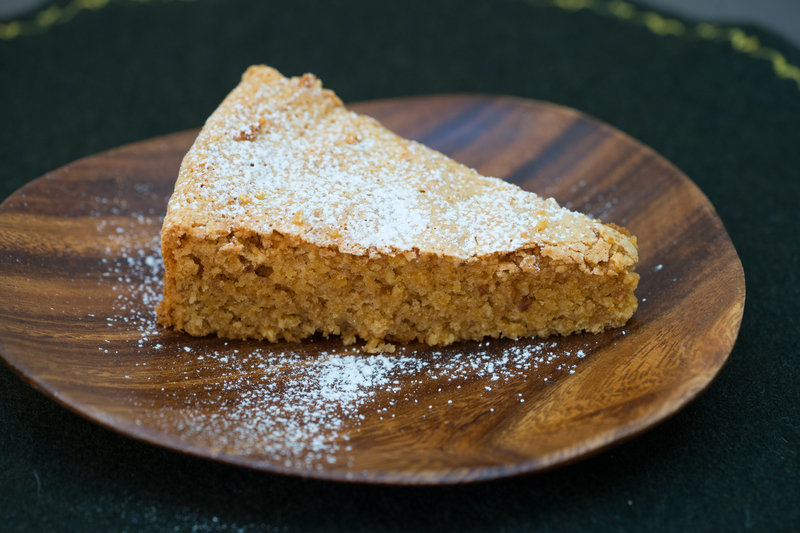 It should bake for a total of 40 minutes or until the top is golden and a skewer inserted into the centre comes out clean. 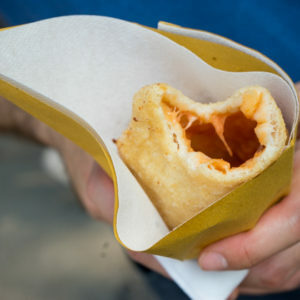 Can be served hot or cold with the cooking juices drizzled over the top. спасибо. Радa, что вы понравились рецепт!